Today I have not one, but two finished garments to share with you! I need to get up to date on my blogging, because my sewing machines arrive in THREE DAYS!!! Can’t wait! Anyhow, these two pieces were some of the last things I made in Boston before the move, and I’m rather proud of them. 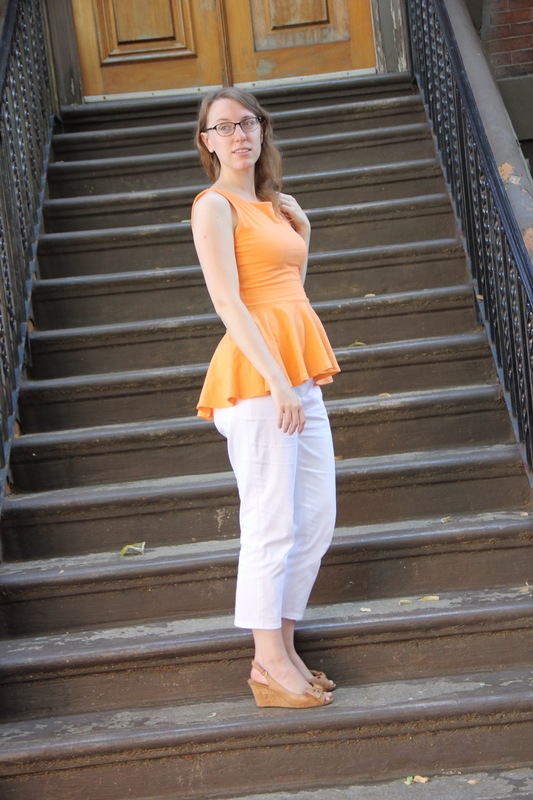 The first is a peplum top version of the Colette Moneta pattern, which I made using Devon’s fab tutorial for a hi-lo circle peplum. 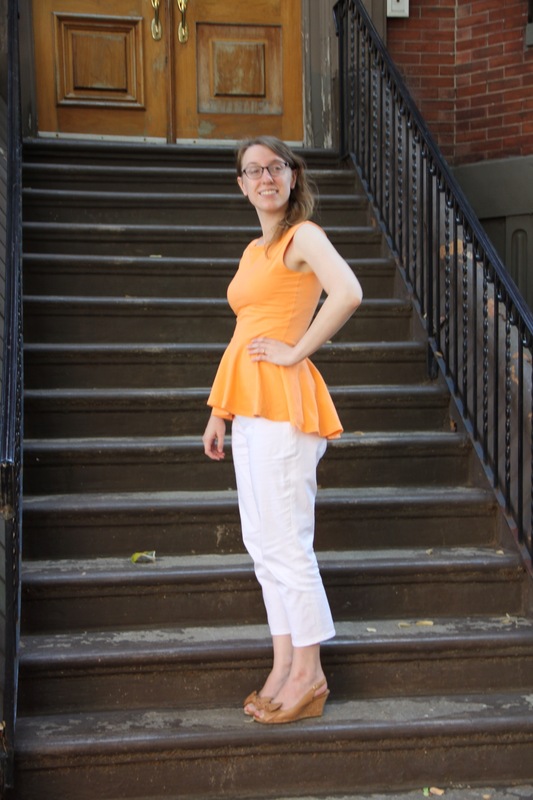 The construction was pretty straightforward – Devon leads you easily through drafting the peplum, and I used another one of her tutorials to finish my armholes and neckline with the bodice lining. Voilà! As you can see, there’s some pretty significant gaping around the neck, which I don’t particularly mind on this top, but I do want to fix next time I make up this pattern (and there will be many more times!). The fabric is a rayon jersey from Mood. It was on sale, and I just couldn’t help myself :P. It has very good recovery, which means that it fits me a *little* tighter than I might like, but the double layer of bodice fabric keeps my bra straps from showing through too obviously. When I asked my husband what he thought of the top, he said it was “bubble gum cute.” I rather like that phrase – I think it describes my personal aesthetic pretty accurately. Sweet, light, and fun! Now for the second part of today’s double bill – the pants! Yes, that’s right, I made pants!! These are definitely still a “wearable muslin” – there’s a lot that’s not perfect about them – but I’m still really proud of myself for jumping in and giving it a go. As you can see, there’s still some pooling under the bum, and the legs a still a little wonky – not sure why. I’m thinking I need to take out a little more a the side seams from the hips downward, but I’m really not sure. There is clearly a lot more experimenting to be done! 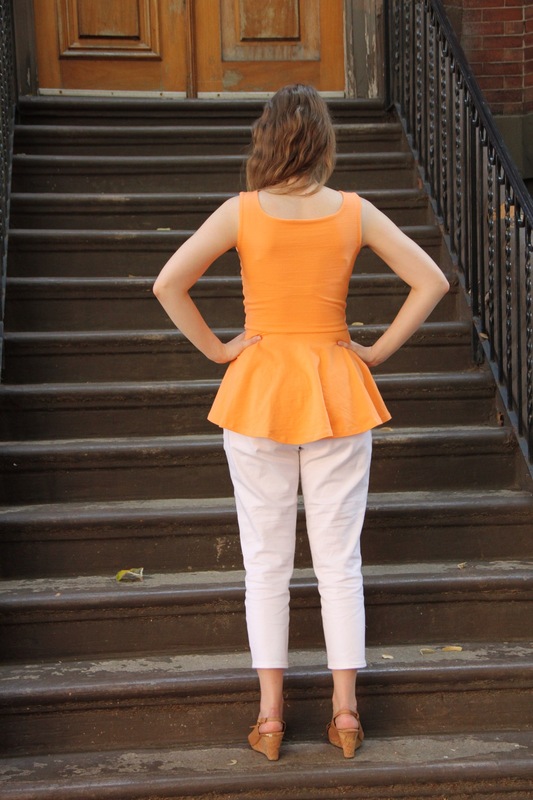 public several times (always with a peplum top, though, to hide my fit issues :P). I would really love to get these fitting well, so I’m sure there will be future pants fitting posts. In the meantime, any pants fitting suggestions would be much appreciated! Anyhow, enough complaining. 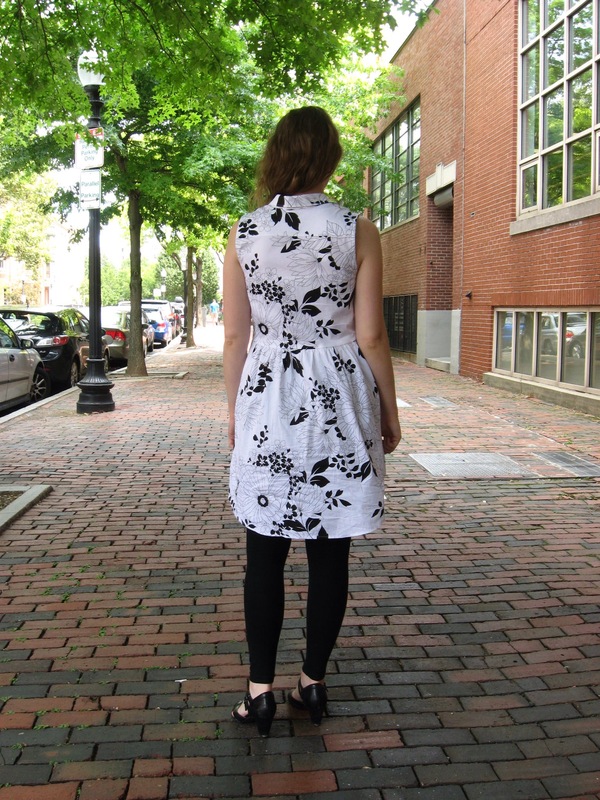 Today I’ll share with you my version of one of the hot new patterns that’s been trending on the blogosphere, the Alder Shirtdress by Grainline Studio. I have to confess, I was hesitant to purchase this pattern, as I was afraid the lack of a fitted waist would make me look like a sack of potatoes. 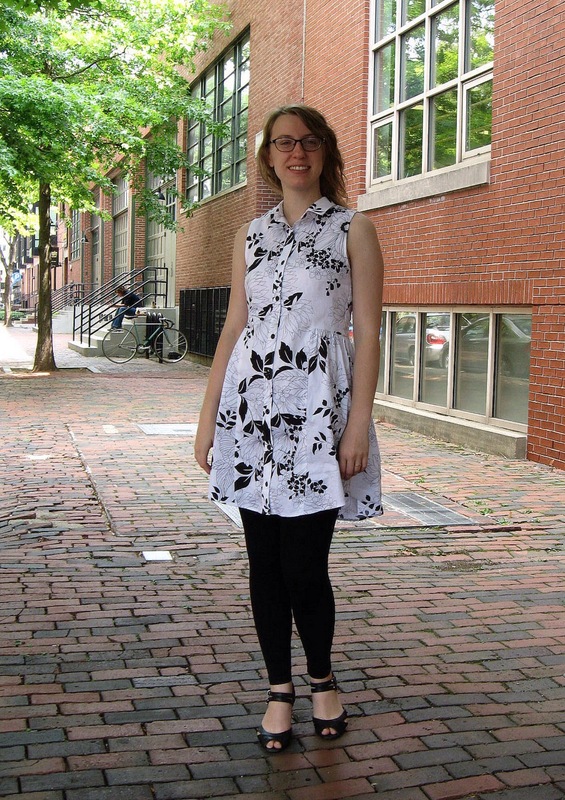 However, I’d been wanting a good shirtdress pattern for a loooong time, so I decided to give it a try. And I’m so glad I did! 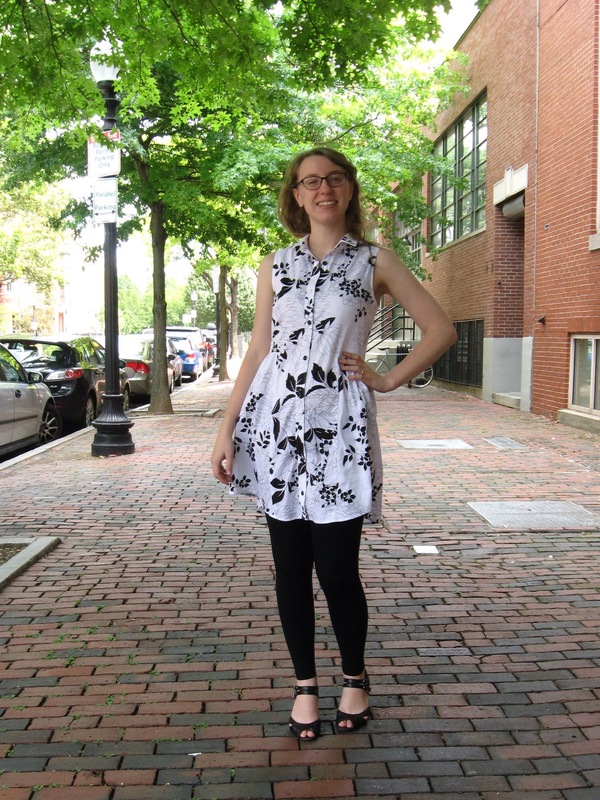 As you can see, I made view B, with the adorable gathered skirt. I made up the pattern exactly as-is, no fitting changes or anything. 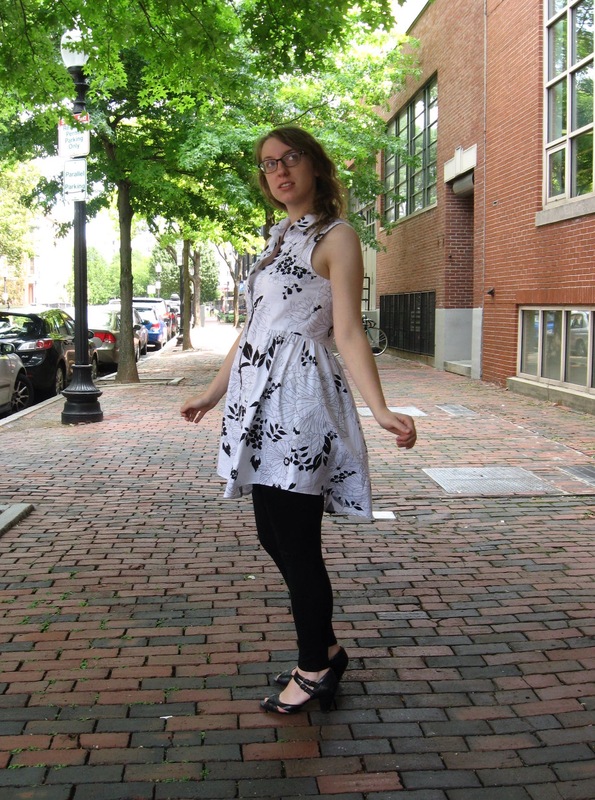 As you can see from the photos, it’s a bit on the short side for my comfort level as a dress (hence the leggings), so next time I plan to lengthen it by 2-3″. Aside from that, I’m quite pleased with the fit. The darts were actually in the right place to begin with, which pretty much never happens for me! Aside from a little button gaping at the bust (which I think was due to buttonhole placement), I’m very happy with the result! I really regret not taking it with me to San Francisco (it’s waiting with my sewing machines back on the east coast) – it’s the perfect style for this city. Also, since it turns out that San Francisco is the land of amazingly delicious food EVERYWHERE, I could use the loose-fitting waist; my other skirts are getting veeeery tight! Sigh. Speaking of expanding waists, I’ve decided to try to add more fitness to my life now that we’re (hopefully!) going to stay in one place for a while. 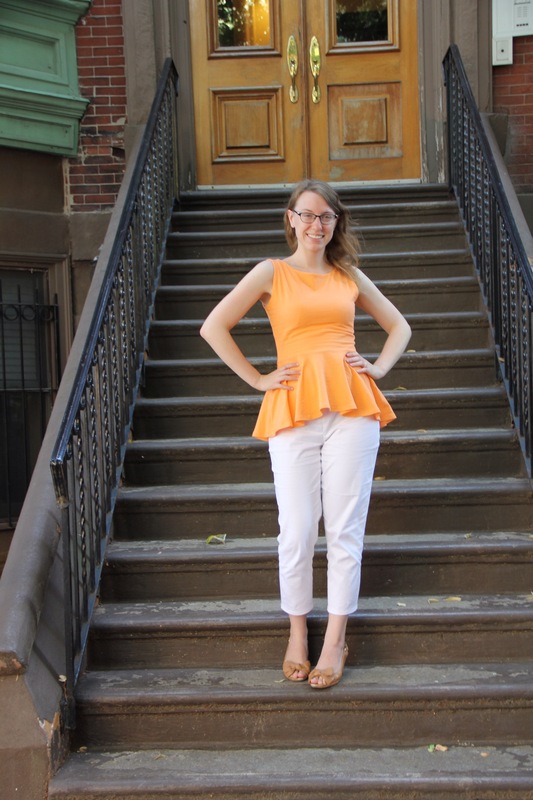 In Boston, I found that it was easy for life to get out of balance, and I figured that the best time to try to restore balance is after a big change. So, I have several goals for my life here on the west coast. I want to establish a regular exercise program, cook more, and sing more. So, yes, this will probably mean a little less sewing, but I think that maintaining a healthier balance of activities will ultimately lead to greater contentment. Here’s to a fresh start! 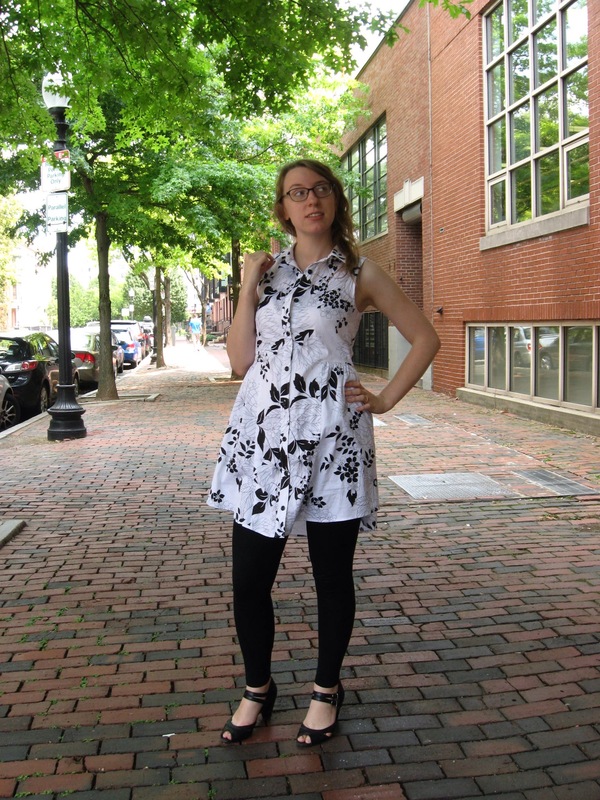 Today’s blog post is brought to you by…sewing from this past June :P. Oops. I did some serious binge sewing before my first move in July, and I’m *still* catching up on all those makes! Thank goodness I have a backlog, though, because it’s looking like it’ll still be several more weeks before I am reunited with my sewing machines. 😥 Major sad face. Anyhow, I bring you my first wearable version the Colette Mabel Skirt. I tried making it once before this one, and the result was…um…not what I expected. The first time around I think I cut a size small grading out to a medium at the hips, but it hugged my body much too tightly for my comfort around the hips, while managing to be too loose at the waist. Plus the little back vent (I tried version 3 the first time) insisted on flipping out, creating a lovely little ducktail in the back. Hrmph. The second time around, I tried to learn from those mistakes. I graded from an extra small at the waist to a large at the hips. I stuck to version 1 to try to reduce any fitting complications. I also added some length – I ended up cutting the longest length on the pattern. Lastly, I straightened out the side seams. I’ve never been a big fan of the pencil skirt on my body – I’ve got a bit of a booty going on, and I don’t feel a strong desire to show it off, so a real pencil-cut skirt has always made me feel self-conscious. So I just widened the side seams at the bottom until they were perpendicular with the hem. Whew! Before cutting into my fabric, I also checked the pattern against a RTW skirt I had that was a similar cut. 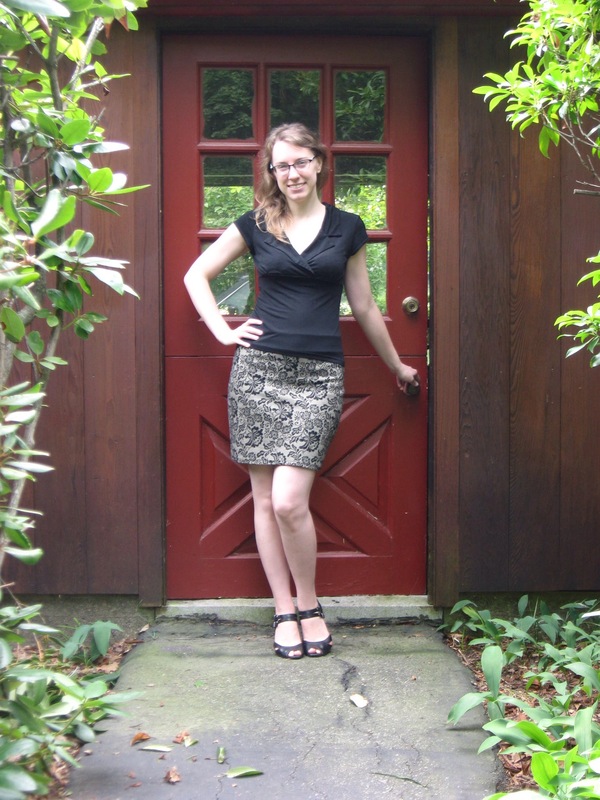 The pattern and the skirt were pretty similar, so I felt comfortable cutting into my fabric (which, btw, is an awesome ponte knit from a local quilt store near my parents’ house in PA…who’d of thunk??). Here she is! Meh. I tried taking a bit of fabric out at the center back seam by the hem, but it didn’t really fix the problem. I later realized (thanks to my mom, the fit expert) that I need to add a wedge to the bum section of the back pattern piece. This will allow a little more room for my voluminous booty…next time! All in all, I’m pretty pleased with the finished product. 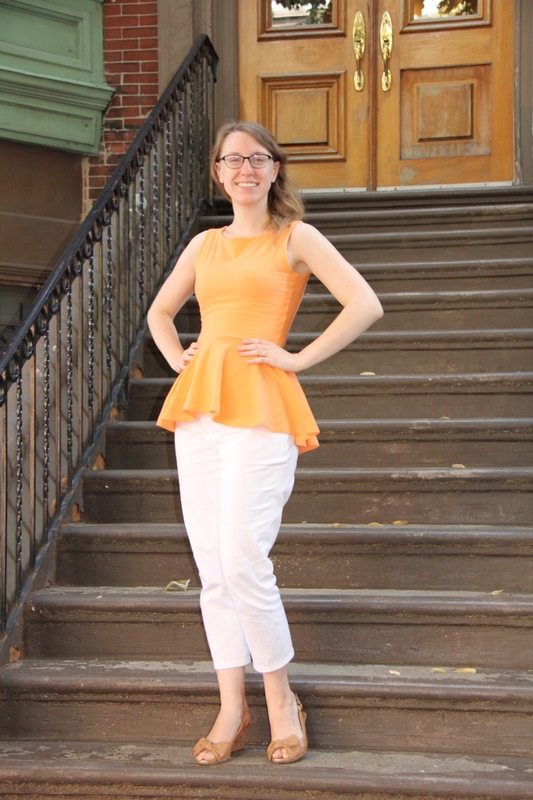 While I’ve never been a huge fan of fitted skirts (I loves me a good flare), I definitely need a few in my “professional wardrobe.” And since this one is made in a knit, it’s still super comfy, and has enough give that I can play the piano without feeling like I’ve been strapped into a mermaid tail. In other news, living in this new city continues to be an adventure! (Meaning, we have no internet, no furniture, and have been sleeping on the floor since Monday :P) I’ve managed to get some pretty fabulous gigs lined up for the fall, however, so I’m feeling more excited about being here. They will keep me pretty busy, though, so maybe it’s a good thing my machines won’t get here for a while!